Tirthas, or Teerthas, are holy rivers, lakes, ponds, water bodies near a temple or in a sacred spot and is famous for the holy and divine nature of the water. These water bodies are known as Tirtha and is of great importance in Hinduism. A water body becomes sacred after being connected to a divine incident or a holy saint bathing in it or due to miracle or finding something in it associated with a Hindu deity. There are also Tirthas that are mentioned in the Puranas, Ramayana, Mahabharata and other epics. Earlier the Tirtha included holy persons and even pious devotees. Thus a person who had studied the Vedas was a Tirtha. Padma Purana refers to the teacher, mother, father husband, wife all as tirthas. In Rig Veda, a tirtha was a shallow area of a river. But later Tirthas became associated with a holy water body. Thus the Skanda Purana says that a place on earth resorted to by the ancient good men for the collection of merit is called tirtha. The Brahma Purana classifies tirthas into four categories such as Deva, Asura, Rishi and Manusha created by gods, demons, Saints and men respectively. Today, people visit Tirthas to find cure to diseases, for sin redemption, to attain Moksha or Salvation and to offer prayers. Some of the important Tirthas in India are Rameshwaram, Kaveri River, Puri, Girnar, Ujjain, Benares, Mathura etc. Tirthas become holy during specific occasions like eclipse, alignment of planets etc. 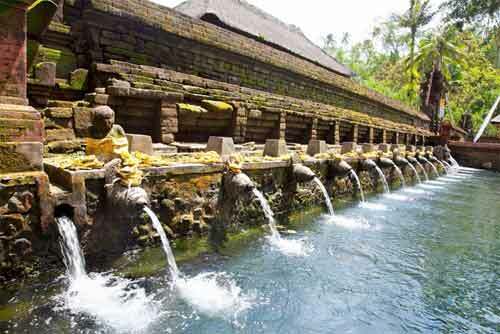 There are also Tirthas in Bali (Indonesia), Malaysia, Sri Lanka and in other places associated with Hinduism.